Maestro John passed away on February 16, 2017. Over 30 of his students met and raised a glass the following Thursday at 7 PM, the traditional day and time of John's advanced fencing class. The best way to learn about Maestro John DeCesare is to listen to his exciting stories in person! This charming gentleman has been a professional dancer, stage magician, movie actor, historical re-enactor, pilot in the Army Air Corps during World War II, and, of course, a fencing master! 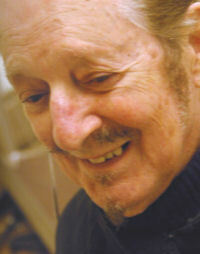 John received his master's papers under the guidance of world-renowned instructors more than forty years ago. In 2005, John joked, "I've been fencing so long I had to throw d'Artagnan out — he wasn't very good." John's passion for fencing has inspired generations of students. "They came from all over to be here," John observed in 2008. "There's something about fencing that sets it apart from any other sport. ... Fencing develops a family unit and it's a great art to get into." John often emphasizes that fencing is an equalizer: agility and speed can cancel size, and knowledge can cancel physical prowess. 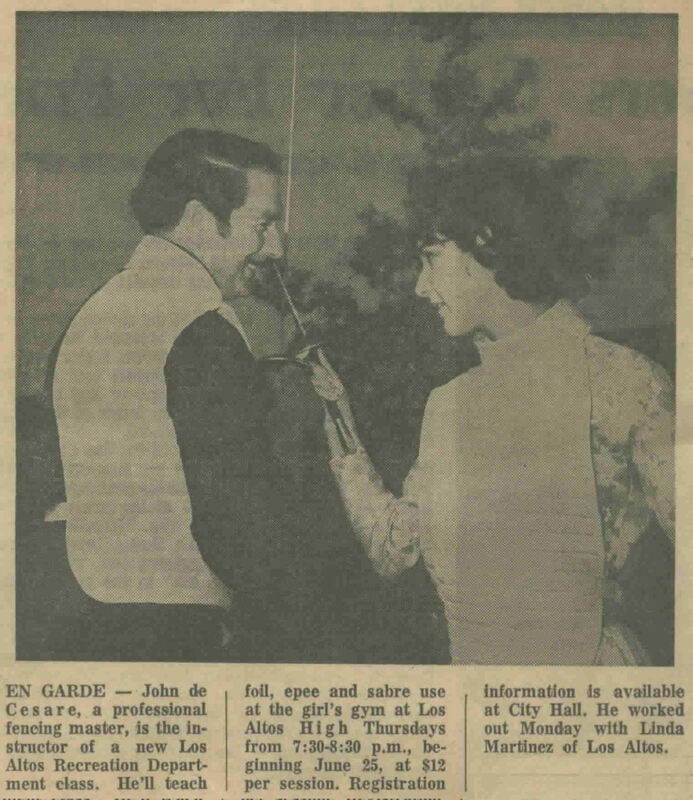 In the 1970s, John founded the Salle DeCesare as an independent small business, one of the first fencing schools in the Bay Area. He emphasized good sportsmanship and good comradeship as well as fierce winning strategies. But while many of John's students have gone on to win championships and compete at the highest levels, and his skills and techniques are much admired by his peers, his Salle did not endure as a business venture. Many of John's students followed him from his own establishment to his contract teaching assignments. Just before his retirement, John taught fencing at Gavilan College in Gilroy and for the FUHSD Adult School program in Sunnyvale. Previously, he had also taught at the Centennial Recreation Center in Morgan Hill, for the Los Altos Recreation Department, and many other schools and community groups. John was born in Beverly, Massachusetts, but by the time he started high school, his family had moved first to New York, then Chicago, and finally Detroit. It was there that a friend introduced him to fencing, and his passion for the sport bloomed from his very first lesson. John served as a pilot in the Army Air Corps during World War II. Shot down over the South Pacific, he was medically discharged and returned to Detroit, where he became a tool-and-die maker in order to pay his way through school. 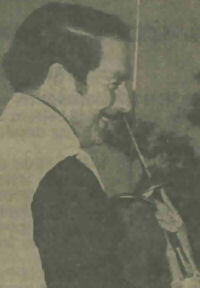 John performed small supporting roles in the adventure films The Black Swan (1942) and The Spanish Main (1945), both with a prop sword in his hand. John likes to say that by the end of a beginner's course with him, any student can out-fence swashbuckling movie star Errol Flynn (1909-1959) — because real fencing is nothing like movie fencing, and the big gestures that look dramatic on stage and screen would get a fencer killed in a duel, or beaten on a strip. As the vaudeville era wound down, John starred as half of the "Cesare & Ginny" dance duo. During a one-night gig, John met a magician appearing on the same bill; subsequently, John got to know him well, and whenever their paths crossed, John asked him "to teach me some magic." John bought books and took classes in magic, practicing and expanding his skills until he developed engaging routines of his own. John has been a member of the International Brotherhood of Magicians, Vice-President of the Mystic Thirteen Magic Club, and a member of the Ring 21 Magic Circle. Once, a knee injury prevented John from performing the stage show for which he had been hired by the San Mateo Historical Society. He decided to sit at a table and do card magic instead. That audience enthusiastically referred to him as a "gambler," and so "High-Card Johnny" was born! 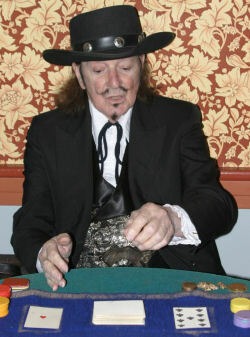 John immediately started researching Old West gamblers and incorporating into his magic act card tricks based on poker, blackjack, bridge and chuck-a-luck. The last game High-Card Johnny added was faro, a game originated by Napoleon's troops in Egypt, which became popular on riverboats navigating the Mississippi River in the early 1800s (and so was very characteristic of his gambler persona). Adams, Scott. (2008, January 29). "En Garde — Fencing Back in Town." Morgan Hill Times . Retrieved from http://www.morganhilltimes.com/. Munsen, Kristen. (2005, April 11). "Rapiers Drawn at Gavilan." Gilroy Dispatch . Retrieved from http://www.gilroydispatch.com/. San Juan Batista State Park Volunteer Association. (1990, June 16). Ninth Annual Early Days in San Juan [Brochure]. Sacramento, CA: California Department of Parks and Recreation. Archived: Transcription (PDF). Uncredited. (June 1970.) 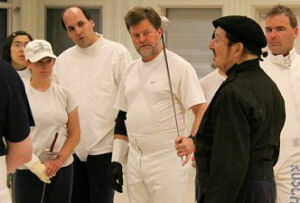 "Beginners Fencing Class to Be Held." Palo Alto Times . Page 24. Archived: Scan 1 and Scan 2.